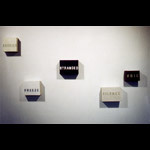 Lisa Fedorak’s small text panels appear in groups in the gallery space, like outcroppings or outbursts. 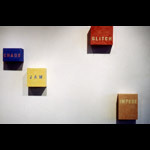 The words, including “Jam ”, “Freeze ”, “Barrier ”, “Void ”, are choppy and visceral, and connect to the other frames in a contextual way that depends on their position and their place in time and space. Lisa Fedorak is a Vancouver based artist and administrator. Her practice is centered on communication, its successes and failures. She stutided at The University of Western Ontario (MFA) and Emily Carr Institute of Art and Design (now University) (BFA). She has exhibited at CSA, grunt gallery, Access Artist Run Centre (now Gallery), Forest City Gallery, Anodyne Contemporary, and Atelier Gallery among others. As an arts administrator, she has run Access Gallery and Malaspina Printmakers and is currently the Program Administrator at the CAG.